Mulledore Ranch is right next to ours outside of Glendive. 2 brothers, Don in Glendive, Bob in Missoula. 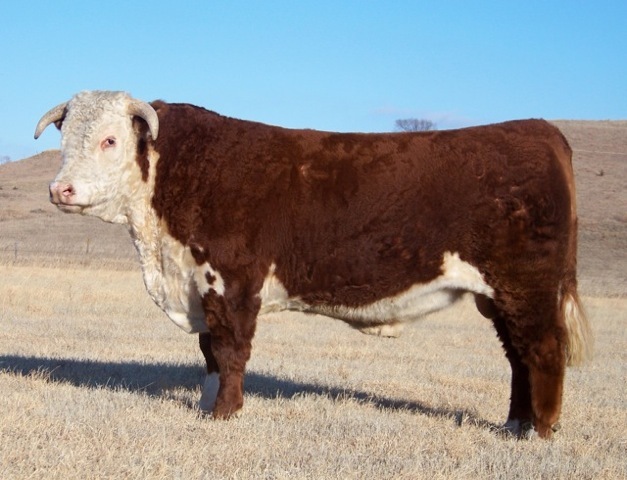 Were selling bulls from 5 different breeds., hereford included. Don't think they are selling bulls any longer. Marvin Feddes & Sons (Dan and Tim) is feddes.com. Bought a Go Excel L 18 bull from them a few years ago. Courtneys no longer have sale, private sales only. James Steen? Is he still breeding? One of our best threads ever. Hope you guys keep it up. One old and respected name in the American Hereford history that is not on the several lists here is WHR (Wyoming Hereford Ranch ...). Does anyone on HT know what happened there? I think they ran into a small problem. At least that's what some lad in St. Louis told me. I think Winrock started as Turner Ranch, the in went to Winrock (Winthrop Rockefeller ) then they dispersed and it went commercial. If My memory is correct the Bill Jacobs got the ranch and then after he died it was dispersed. Turner Ranch owned by Roy Turner had a Dispersal Sale scheduled for early June of 1963. It went as far as Catalog being printed. I have one that I think Paul Stidham gave to me. Winthrop Rockerfeller purchased the Ranch and cattle privately before the scheduled sale. Winrock operated the ranch until January of 1971 when Gene Brinkman and Bob Loughery bought it in its entirety. They also operated LB Ranch at Dexter KS which Bill House later acquired and leased Mullendore Cross Bell Ranch in Osage County and The Stan-De Hereford Ranch south of Nowata which they called Smoke Rise Ranch. Held The Mainstream Dispersal Sale in June of 1972. Sold the Ranch in 75 or 76 to someone I cannot remember. The people who bought it soon sold it again to Roos Cattle Company who were originally out of Texas. They had purchased one of Chapman- Barnard Ranches which bordered Turner Ranch to the north. I don't think they stayed with registered cattle too long. Sold the ranch to Jacobs Family about 1990 I think. I talked to Gene Brinkman last fall. He still sounded pretty good and lives in Arkansas City, KS. He was very good to work for. Gave everyone who worked there a month's pay as a bonus after The Mainstream Dispersal. Last I knew Tom Harris was still near Mill Creek OK and Bob Felton in Ardmore. I am fairly sure Jason Jacobs and his family still own the ranch. I think it is commercial and largely stockers. Quite a good ranch. The last I knew about WHR The Hales Family still owned part of it but it was for sale. I do not know if they still had any cattle. I think Mrs. Hales was part of The Neilsen Family who bought it from Levy's who bought it in the 50's when it came out of the trust that owned it for a long time. Torres's Veladi Ranch infused a lot of money into a few programs but in the was rather short lived. Carlson's dispersed in the early 2000s I think but don't know what became of Raymond Nelson thought he had some real good ones. Have seen where Jerry Carlson son in law has some registered cattle. Damn, you and I are starting to get long in the tooth Randy. Isbell Herefords @ Wilsall, MT ( In the shadow of the sleeping giant) Virgil Isbell was a really good guy.... His obit read... " I never sold my saddle or my tack and I never bred them black"
Roy Turner bought the ranch and cowherd of Robert Hazlett. I grew up listening to my Dad talk about how Turner ruined the best herd of the day with Zato Heir. It is fun to read you old guys reminisce, but probably just talking to yourselves. Did anyone see the one segment RFD did on Herefords? Kind of disgusting that our AHA PR crew knows so little about our history they said Marvin Meek was John Wayne's partner in 26 Bar and showed a picture of Wayne and Louis Johnson and identified Johnson as Marvin Meek. Shows how little our Hereford heritage means to our leaders. No wonder they can't see anything special about Herefords. There is also a video of Glynn Easley DVM at Turner ranch somewhere.... Made just before he passed away. Herschel Boydstun worked for Roy Turner at one point in time. Gov Turner sent Herschel to Patterson's in North Dakota to buy a brother to HT Tone lad... Herschel got there and found that the bull was a Line Back... herschel always talked about that trip to ND and what hell of a drive it was to come home empty.. The Trask herd in SC is gone as I remember it in the 70's with 400 head of powerful line bred Plato Cattle.. Thank goodness there are some of us putting it back together but so many good cows scattered to the wind!!! The Orvis ranch is just up the road from us. Established 1918, brothers Bruce and Jim Orvis split the ranch and cowherd into Orvis Cattle Company and Jim Orvis and Sons. Bruce and Jim died a few years back but both families still have Hereford cattle though OCC is no longer registering calves. I don't know the full story but they got hit hard by IE. We had a several of the Line 1/ Trask females. Milked like crazy but I culled everyone for bad udders , too much hair and bad feet.. They were 3 year olds. Train wreck... May be the fescue .